In Greek mythology, Cassandra was the daughter of Priam and Hecuba, the king and queen of Troy. Cassandra was the most beautiful of Priam's daughters, and the god Apollo*f fell in love with her. Apollo promised Cassandra the gift of prophecy if she would agree to give herself to him. Cassandra accepted Apollo's gift but then refiised his advances. Apollo was furious, but he could not take back the powers he had given her. Instead he cursed her, proclaiming that although she would be able to tell the future accurately, no one would believe her. Before announcing her prophecies, Cassandra went into a type of trance that made her family believe she was insane. In Homer's Iliad * , Cassandra predicted many of the events of the Trojan War*. Priam's son Paris planned a trip to Sparta. Cassandra warned against it, but her warnings were ignored. Paris traveled to Sparta, where he kidnapped Helen, starting the war with Greece. Cassandra later predicted Troy's defeat and warned the Trojans not to accept the Greek gift of the Trojan horse. Again she was ignored, and Greek troops hidden inside the wooden horse captured the city. During the battle, a Greek soldier known as Ajax the Lesser* raped Cassandra in the temple of Athena*. Athena later punished Ajax and his men for the deed. During the Trojan War, Cassandra, the daughter of King Priam of Troy, was attacked by Ajax the Lesser in the Temple of Athena. The scene is illustrated in this painting from a house in Italy. After the Greek victory, Cassandra was given to the Greek leader Agamemnon* as a prize. She bore Agamemnon two sons and later returned to Greece with him. However, she also predicted that a terrible fate awaited Agamemnon and herself. 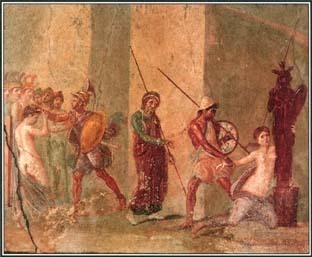 When they reached Agamemnon's home in Mycenae, they were both murdered by Agamemnon's wife, Clytemnestra, and her lover, Aegisthus. See also Agamemnon ; Apollo ; Athena ; Clytemnestra ; Greek Mythology ; Hecuba ; Helen of Troy ; Homer ; Iliad, the ; Paris ; Priam .